So I had been using ready man for the past couple months. I've tried other supplements that were a waste of money. This pill was actually effective. Unlike other supplements that come with like 50-100 pills that didn't work at all, I was initially disappointed in seeing only 10 pills. But later found that these pills were effective in a subtle and natural feeling way. No headaches or no caffeine effects. I've tried other pills that seem to make your heart race because they had caffeine but ready man did not have those bad effects. It was just a dark pill that looked like it was actually made with herbs and not some white gelatin capsule. It works but more naturally. You won't get an erection automatically unless you get aroused or get sexually stimulated. 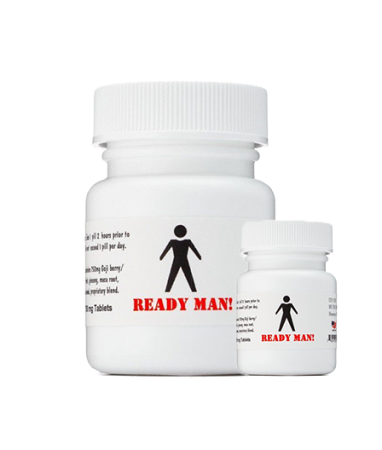 For this reason ready man was the most natural supplement that I have ever taken that worked. I went online on amazon to re order a third time but found the product is currently unavailable on amazon now. I wrote to them to see if they will have more supplies in the future or if they will change the name so I can reorder later. I don't care if your reviews said that milligram dosage were lower than other supplements. At the end of the day, this product worked and was more affordable at about $35 for their 10 pill bottle.